Though a lot of what I enjoy about food blogging lies in the creation and development of new recipes, it also pleases me greatly to write recipes for classic dishes and timeless combinations. 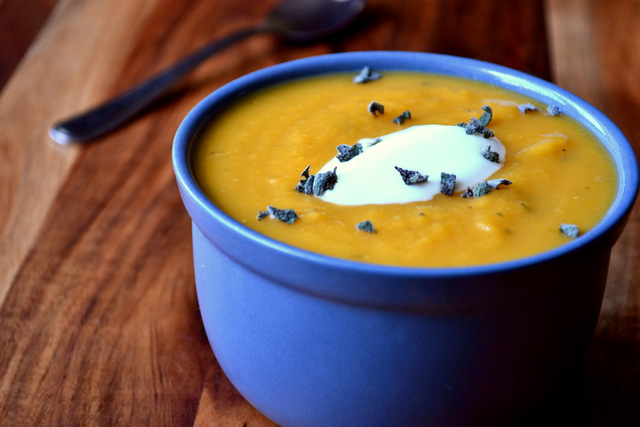 This is where recipes like Pumpkin and Sage Soup come into play. Trust me, you’ll not be able to help but enjoy this autumnal favourite. Let’s face it, the combination of sage and pumpkin isn’t anything new; it has been featured a million times before in a million different places. However, when one stumbles across a delicious rendition of a recipe, it’s difficult not share it just once more! The sweetness of the fruit and sage balances perfectly, yielding what is truly one of the most enjoyable bowls of soup I’ve ever had. According to numerous sources, pumpkins are proving unusually expensive this year. 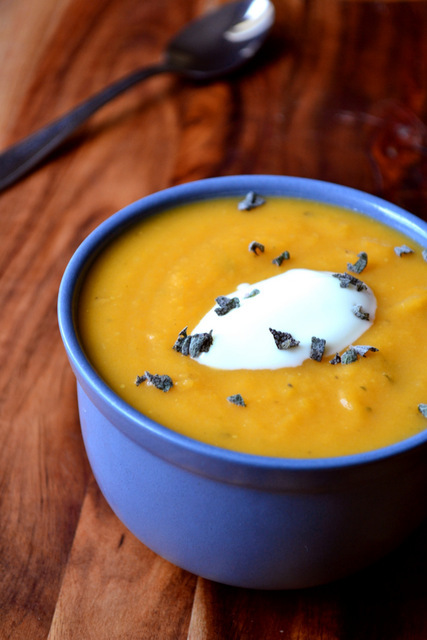 While I haven’t stumbled into this problem myself, there is an alternative for those of you that have; butternut squash. 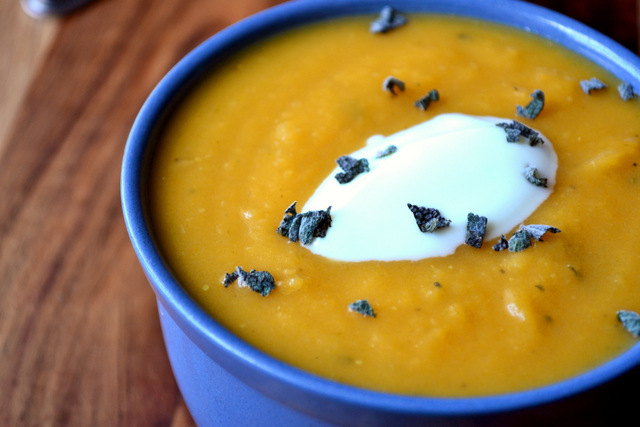 Squash is a perfectly acceptable substitute for pumpkin as they are more or less akin to one another. In honesty, the main issue with this recipe is the sage. Sage can easily overpower a dish, so don’t be too liberal with the firm flavoured herb! 1. 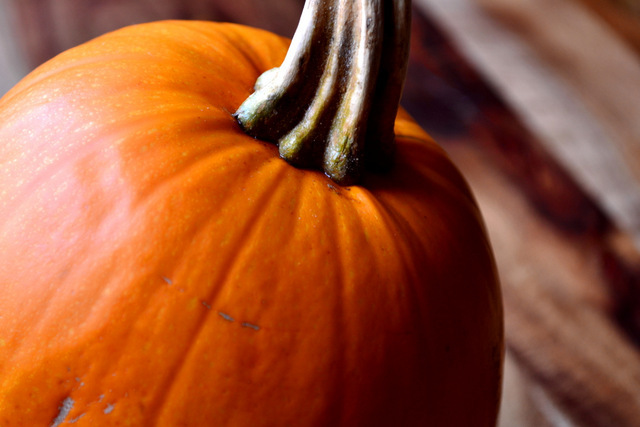 Preheat your oven to 200C while preparing your pumpkin. Drizzle the chunks lightly with oil and sprinkle with salt – roast until golden brown. Meanwhile, fry the onions in a little oil and gently boil the potatoes until soft. 2. Add the roasted pumpkin, potatoes, whole sage and bay leaves to your onions. Tip in the vegetable stock and leave to simmer for 30-40 minutes. Remove the bay leaves, blend until smooth, sprinkle with the finely chopped sage and serve immediately. Cost: As I mentioned in my recipe for Pumpkin and Chorizo Pie, it is possible to pick up a decently-sized pumpkin for around £1. As such, this soup is incredibly cost effective at this time of year and should set you back little more than £1.50. Seasonality reigns supreme! Thanks, Spree! I haven’t tried that, but I’ll certainly have to. Thanks for the tip! Thanks for your butternut squash alternative and also for your cautionary statement re: sage. A lil’ goes a long way! Sounds (and looks) like a lovely soup. My pleasure! Sage can be dangerous indeed. This just screams “autumn” — love it. Thank you! I hope your plans came together well and he enjoyed his soup! That’s a shame – I really hope you enjoy mine :). I promise it’s delicious. That’s all right for some – I cycled 80 miles yesterday and though my fingers might drop off! This looks lovely! Sage and Pumpkin are so wonderful together. Thank you for the recipe! Thanks, Deanna! They do work beautifully with one another.